Let me start off by saying I'm aware of the wrinkled mess this dress is in the first picture. It was either the wrinkled mess picture or the night-time-flash one in our living room (below). I opted for natural light, and plenty o' wrinkles first. The wrinkles were courtesy of an entire day at day care... now you understand. I'm sure there is a pound of sand in her shoes as well. The one with the flash was taken in the morning before day care... yep, still dark out. First step, my husband's closet. I know, I raid his stuff a lot for sewing projects. But, since we had just done a closet clean out/Goodwill trip, he had no dress shirts I could cut up. Plan B, go to Goodwill. Since the closest Goodwill to me is actually really close to my work, I went on my lunch break sans kids. One trip through the men's shirts and I found this striped one with some pink it it for $2.00 ish. Did I mention it was a men's XXXL?! So much fabric for $2! Awesome! Side note: Those pink shoes she is wearing I also got on the Goodwill trip for $4! They are from Gymboree... score! Here is a really horrible picture I took with my phone the night I started to cut the shirt up. Since the picture was so bad anyway, I crapped it up further by making it black and white, super grainy, and added some lovely hand drawing ala the mouse. There's my kid sitting on the shirt. If she were to lay down she wouldn't even take up half. It's huge. I also want to point out she went to bed right after this photo. I don't know how the tutorial lady did it with her kid there and awake. I sewed while the kids slept and my husband was on a conference call. I do remember running in to excitedly mime to him the progress I was making while waving dress parts in his face. And him waving me off like a I was a crazy homeless person trying to wash his windows or something. Maybe I should have waited until he was off the phone. hmm. I think the sleeves are so cute. Make one! Goodwill has way too many dress shirts anyway. Can you tell someone is really sick of taking pictures? 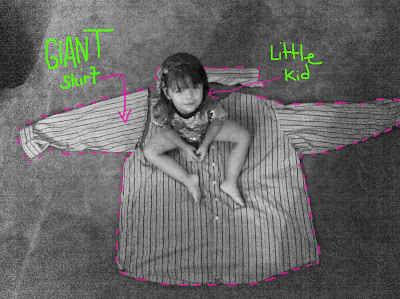 I have a mens shirt that I have been wanting to make into a dress. This is such a cute way of doing this. I love it! this is absolutely darling! and inspiring!